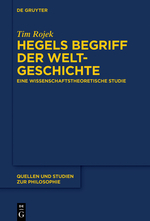 We are happy to give notice of the publication of Tim Rojek’s book Hegels Begriff der Weltgeschichte (DeGruyter, 2017, 310 pages). the perspective of the philosophy of science (in a broad sense, i.e. includinghumanities). The volume focuses on the relationship between historiography and the philosophy of history.